Our collected treasures from the last month... feathers, heart shaped stones, skeleton leaves, sea glass (including a blue piece - woohoo!) a piece of washed up circuit board, driftwood, seedpods, Archie's moon rock and dinosaur fossil, some Lego and an egg shell. 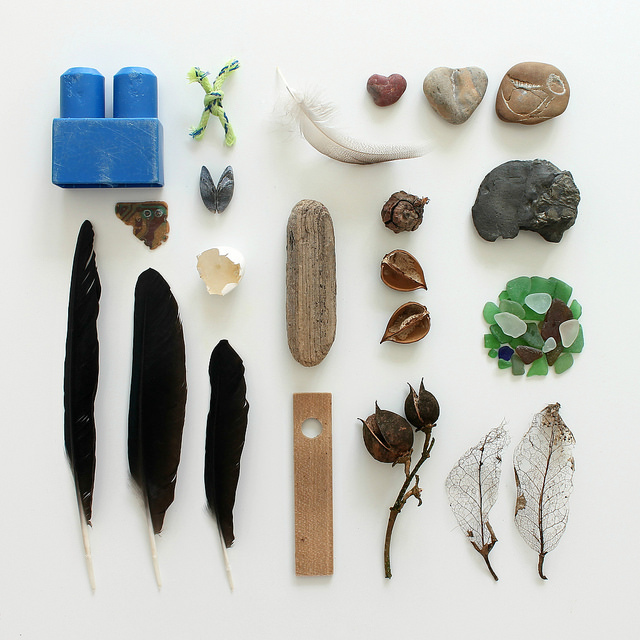 Each month I'm photographing our collections of bits and bobs that we accumulate on our adventures out and about, a way to remember and record all the little treasures we find. 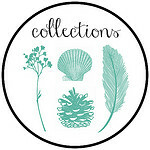 You can see my first post here and more collections on my Pinterest board here! Please feel free to join in any time if you'd like to share your collections too. I've made a coded grab button over at the bottom of my side bar if you'd like one - hopefully it should work ok! This is fabulous, Caroline. I love each of your collections, there's always so much to investigate. I love the sea glass here, the colors are beautiful. I whoop if I ever find green pieces. I would love to join in with your collections series, but my collages would never look as fabulous. What a beautiful collection. I picked up a couple of those pine coney-type seed things, I love how they are fitted together so neatly. Lovely! You make me want to go out for a rummage on the beach! I'm loving this idea. I may well join in ... I'm terrible for picking bits of things up wherever I go. This is such a lovely idea. I may well join in with you if that's ok. Will it be a regular thing or just as and when? Your collections are always so beautifully arranged.